We offer a national ITE programme tailored to the needs of beginning teachers, delivered across the country, free of charge. This is the first step into the wider community of teachers who teach about this topic. The days regularly combine subject groups to enable student teachers to explore the pedagogy and assumptions of each other’s subject. 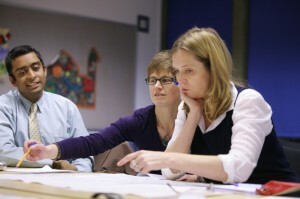 Looking at the current state of Holocaust education in England: What the Centre’s groundbreaking research has revealed. Practical classroom activities with effective teaching and learning materials. The significance of the Holocaust: what was lost in the genocide through a consideration of pre-war Jewish life? Multidisciplinary approaches to teaching about the Holocaust. The legacy of the Holocaust. Whilst these broad themes provide an outline of the day, the IOE team works closely with individual PGCE tutors to ensure that the needs of specific groups are understood and met. We also offer specific ITE days for Citizenship in which we explore the nature of justice through the experiences of a particular family. View our list of courses and events to see what ITE dates are currently available to book onto. Our Core CPD day is our principal introduction to the key issues in Holocaust education and is relevant to all teachers. View our range of resources accessible through participation in our CPD programmes. Includes some open access resources.